The devastation of a natural disaster is often encapsulated in a few bolded words across a headline: "Death and Destruction" or "Catastrophic." While these words may reel in assistance from far and wide, they do little to blunt the long-term devastation that comes from such an experience. This is particularly true in countries with poor economic and government infrastructures and corruption, such as my home country, Bangladesh, where all too frequently one can expect recovery efforts to take many years. Even after this "recovery" phase is complete, many countries like Bangladesh and Nepal, especially prone to natural disasters, are left lagging behind and are ultimately forgotten. For years I wondered what could be done differently. What would help us recover, while also creating a more resilient and innovative economy? I found the answer nearly two summers ago. Photos courtesy of Khalid Ayaz Khan. In the summer of 2016, I came across such a solution: one that aimed at delivering education in the form of vocational training. Thrive Projects, Inc.'s mission of developing sustainable, community-based solutions through customized vocational training programs strongly resonated with me, and without any hesitation, I joined. Over the last two years the company has evolved to also address some of the greatest challenges of underdeveloped communities, including energy access, healthcare, hygiene and literacy, all while using the same model of vocational training programs. When natural disasters strike, people living in vulnerable countries like Bangladesh and Nepal are often left with nothing, with aid weeks away and recovery close to impossible. At Thrive, the belief is that by educating people on how best to utilize local resources available to those in similar situations and training them to do so, they can be better prepared and learn to take initiative of their own recovery, rather than waiting on the government or foreign aid to deliver help. In the summer of 2017, I had the privilege of living and working with the local Thrive team in Kathmandu, Nepal. I couldn’t have asked for a better getaway, as I saw spectacular landscapes, met admirable people and ate mouthwatering food throughout my stay. However, what truly distinguished my stay was the amazing things I learned and saw. I was fortunate to visit Janaki Nagar, a small village of displaced immigrants in the region of Terai. Ignored by the government as undocumented residents, the village didn’t receive any electricity, had food scarcity and a critical health and hygiene problem. With the hopes of alleviating some of the problems they were facing, in collaboration with the Global Peace Foundation, we installed solar panels, distributed health and hygiene goods, set up a health clinic and delivered training and motivational speeches. 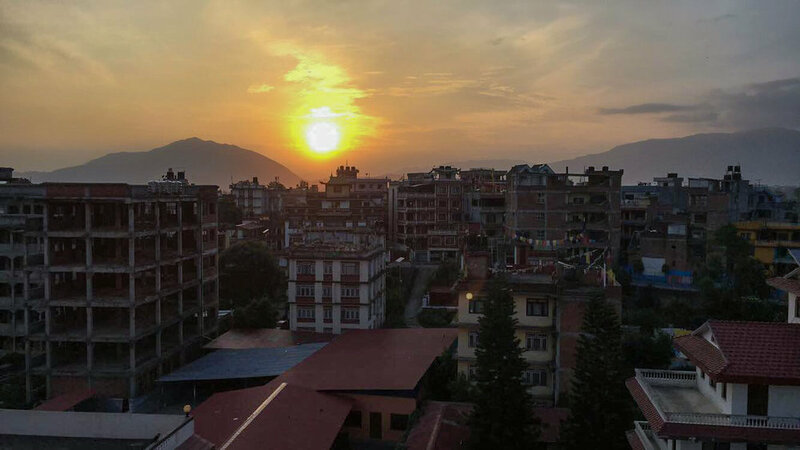 As a subsidiary non-profit organization, Thrive Nepal has been tasked with continuing the work that Thrive Projects, Inc. began, but now with locals and former students taking the lead. In addition to volunteering globally, I have worked in the area surrounding my university in Syracuse, a city typically depicted as an expensive university town where all the rich kids go. However, the poverty, homelessness, negligence and hunger I have seen here in Syracuse, existing merely miles from campus, remind me of Janaki Nagar and Bangladesh. Volunteering as a tutor and a mentor at the Northside Learning Center, I have had the opportunity to meet people from all over the world and learn about their living conditions and livelihoods. Through research and multiple encounters with the community that surrounds the campus, I realized that due to low socioeconomic circumstances, there were many living in Syracuse leading a poor quality of life. Many of them are also former or current refugees and new arrivals in the United States. With the hopes of working towards a solution, students at SU are emulating the work that Thrive does abroad and are now focusing on working with local non-profits that specialize in improving services for residents in need. By bridging the gap between the on-campus population and the city beyond campus borders, we encourage cultural awareness, and advocate for issues that exist in the surrounding area. This year, we are working with Interfaith Works of Central New York and their Center for New Americans to support their mission to provide a new start for refugees and ensure their successful integration. As I see organizations like these working to help others in communities near and far, I am inspired to do more. As a global citizen, my hope is that my experiences can encourage others to get involved as well and strive to live, learn and thrive together. Khalid Ayaz Khan is a senior studying economics at Syracuse University.